OMG do I love this lipstick? HELL YES. I picked this lipstick up from Superdrug at the weekend after I saw a friend wearing it, asked her where it was from & there I was in front of the Collection counter scanning for it! Normally with red hair & green eyes who goes for a purple lipstick but somehow it just works? It does make me look slightly pale but nothing a little blusher & bronzer can't fix. Apart from the colour I actually really like the packaging as well. The gold detailing on the tube makes the lipstick look more high end than high street. It also feels very sturdy & not at all cheap despite the very affordable £3 price tag. I only have one downside... it is extremely drying on the lips even with lip balm underneath. It clung to dry patches on my lips so I had to re-apply about 3 or 4 times when I was out Saturday night. However, the colour doesn't fade its just where your lips look so dry you have to apply more lipstick? I definitely recommend this lipstick purely because of the colour! Seduction & revenge - the two other colours in the range - are definitely on my wishlist as they are perfect berry colours for this season. 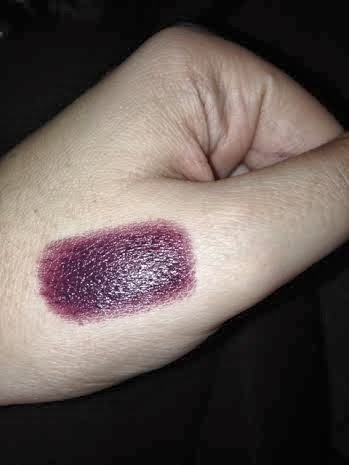 You can pick up this lipstick from Superdrug store or here on the Collection website for just £3. What are your thoughts on these lipsticks if you've tried & tested?